The Advanced Traders Library I is a powerful compilation of 10 mechanical trading strategies that will give you more than just a starting point for strategy development. These strategies are designed to give increased insight into proven techniques - all formatted to fit seamlessly within your Trade Navigator. 10 strategies have been developed to maximize market efficiency and minimize risk. Gain efficiency using dependable techniques and reliable strategies that will perform time after time, with organized performance with minimal effort on your part. We’ve done all of the programming for you! 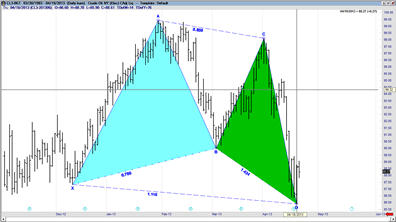 Witness trading concepts in action by applying strategies to your chart. Uncover new ways to augment an existing trading strategy to increase profits and limit loss. Run reports on any or all of the included strategies to review performance. Learn new ways to combine indicators and concepts to enhance strategy creation and trading skills. An intraday S&P trading strategy, the A Ten strategy is based on the idea that the first hour and a half of trading in the S&P is significantly more volatile than the rest of the trading day. No signals are executed until after 10:30 AM CST, taking only one trade per day at the highest close of the past 3 intraday bars. For exits, A Ten uses a standard $500 stop loss and an end of day exit. This intraday strategy trades the S&P based on the average trend of interest rates (or Bonds) within the last 24 hours, utilizing a moving average crossovers to determine the trend of the market for entries and exits. ATS Intermarket Analysis identifies profitable moves, making this strategy a very useful tool. 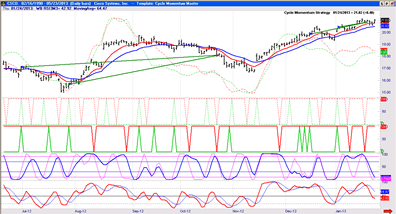 Using the Stochastics Oscillator, this one minute S&P trading system trades only once per day. Buy signals are taken when both Stochastic %K and %D are above 80% and is within the first two hours of trading. Sell signals are taken when both oscillators are below the 20% line and is within the first two hours of trading. Traders may select either a trailing stops or end of day exits. Designed as an example of a buy/sell and hold overnight strategy, the ATS One Night Stay strategy is a useful learning tool for new strategy writers. This intraday strategy shows how to reference a market opening gap and can be traded on any market. Long entries are made at a certain number of ticks above the gap open and trades only once per day, with short entries made a certain number of ticks below the gap open. 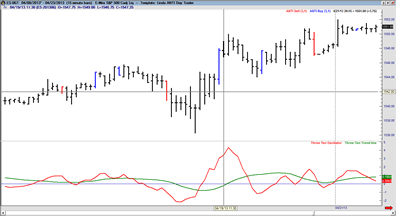 The number of ticks above/below the gap open can be optimized for each of the entry rules. Simple Dollar limit exits capture profitable trades and standard stop loss exits to limit losses. A currency strategy by design, this strategy trades daily bars using rate of change comparisons. Long positions are entered when the ROC indicator crosses above 0, and stays there for at least one bar. Short positions are taken when the ROC indicator crosses below the 0 and remains steady for at least one bar. Trailing stops, breakeven stops, and profit targets are also included, but not enabled unless specified. Boasting a win percentage in excess of 55%, the S&P Banker is perfect for the strategy writer with a good understanding of what’s happening in the markets at any given time. The strategy uses set days and times to trigger trades. S&P Banker is a strict reversal strategy, the only exit is opposite entry. This 180 minute British Pound strategy buys when the 14 bar RSI crosses above its simple moving average of 3 bars. Short entry signals are given when the 14 bar RSI crosses below its simple moving average.